TSLEIL-WAUTUTH/COAST SALISH TERRITORY, VANCOUVER, BC, April 19, 2013 /CNW/ - A group of influential Indigenous leaders joined Chief Maureen Thomas and Council of the Tsleil-Waututh Nation in the signing of an International Treaty to protect land, water and indigenous way of life against the tar sands projects. With ratification from Keystone XL, Enbridge Northern Gateway, Enbridge Line 9 and now Kinder Morgan opposed nations, the International Treaty to Protect the Sacred from Tar Sands Projects effectively closes off all exits for tar sands oil to international markets. The Treaty signing was witnessed at the Sheraton Wall Centre in Vancouver by National Chief Shawn-A-in-chut Atleo, Grand Chief Stewart Phillip of the Union of BC Indian Chiefs, Hereditary Chief Phil Lane Jr. of the Ihanktonwan Dakota and Chickasaw Nations, and Deborah Parker, Vice Chair Woman of the Tulalip Tribes. The International Treaty to Protect the Sacred from Tar Sands Projects was signed by Tsleil-Waututh Chief Maureen Thomas and Jewell James of the Lummi Tribe. The Treaty was created by the Yankton Sioux and Pawnee Nations and has since been signed by more than 10 Indigenous Nations since its creation in January 2013. 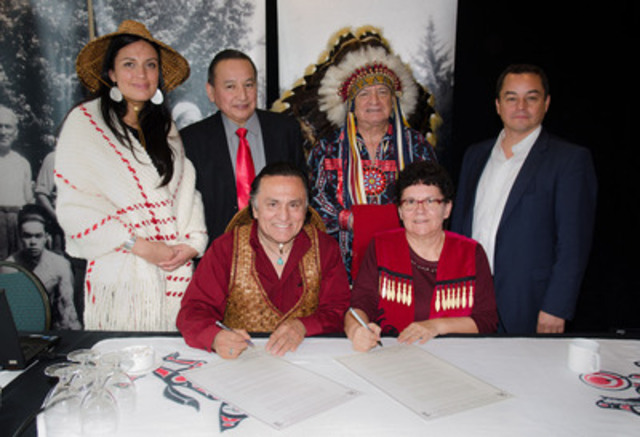 The Tsleil-Waututh is the first Nation to sign the Treaty opposing Kinder Morgan. "The Tsleil-Waututh Nation have a sacred trust, a responsibility to care for our lands and waters," said Tsleil-Waututh Chief Maureen Thomas. "By signing this Treaty, we assert our right to protect our way of life, and to partner with other impacted Nations and Tribes who are taking a stand against tar sands projects. We hope this treaty will send a strong signal to Kinder Morgan and other pipeline companies, that there will be no exit for tar sands oil." "The Assembly of First Nations strongly supports Tsleil-Waututh First Nation's emphasis on partnerships with the surrounding community and actions to enhance relations with fellow Coast Salish peoples and with other indigenous peoples to address common issues," said Assembly of First Nations National Chief Shawn-A-in-chut Atleo. "This Treaty and these actions represent the implementation of key provisions of the United Nations Declaration of the Rights of Indigenous Peoples at a time when First Nations, across the country, are shaping the future of development, sustainability and protection of their lands as necessary. This treaty advances the standard of free, prior and informed consent and ensures that indigenous peoples are coordinating and supporting one another in the advancement of their rights and responsibilities." Following the Treaty signing, First Nations, environmentalists and public leaders are gathering for the West Coast Oil Pipeline Summit. The conference looks at the concept of transitioning from oil-generated energy to alternative forms of renewable energy production. The event was designed using speakers from various backgrounds and expertise in order to generate dialogue on a very complex issue. Speakers include Mayor Gregor Robertson of Vancouver, Mayor Derek Corrigan of Burnaby, Grand Chief Stewart Phillip, President, Union of BC Indian Chiefs, Paul Kariya, Executive Director, Clean Energy BC, Dave Coles, President of the Communications, Energy and Paperworkers Union, and Robyn Allan, Economist. The Tsleil-Waututh Nation is a growing community of 500 located on the north shore of the Burrard Inlet near the neighbourhood of Deep Cove. Tsleil-Waututh traditional territory with its land and waters has been home to the Nation since time out of mind and encompasses approximately 190,000 hectares (720 square miles). The Tsleil-Waututh Nation is not opposed to development, rather it focuses on sustainable projects and methodologies and has been successful in economic development for 20 years. For more information about the West Coast Oil Pipeline Summit, please visit www.twnation.ca.